What does Bionique Testing Laboratories recommend for testing my cultures for mycoplasma? | Bionique® Testing Laboratories, Inc.
What is the intrinsic value of your cell lines and the work performed with them? What are the consequences of mycoplasma infection of these cell lines, the impact on your work, and the subsequent loss of the cell cultures? What resources are available to implement the necessary tests? Consideration needs to be given not only to the investment of personnel, materials, equipment and training but also method validation. It is essential that the performance of any method decided upon for in-house mycoplasma testing be independently evaluated and qualified for your test articles. Examination of these necessary resources will help determine whether you have the capacity to do it yourself (in-house) or whether you need to outsource this service. Are there any regulatory requirements that apply to your research? Once these four questions have been understood and answered, a mycoplasma testing method can be selected and program implemented. Always select the best test you can afford and commit enough resources to do an effective job. Figure 7a - Direct culture is considered the “gold standard” for mycoplasma testing. This method requires complex culture media and use of live mycoplasma as quality controls.s. 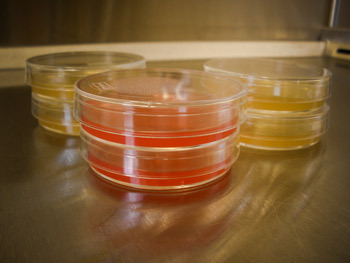 Another limitation of the direct culture method for some in-house testing programs is the quality control requiring the use of live mycoplasma as positive controls. Often times for this reason alone, this procedure should not be conducted in a laboratory where cell culture activity occurs due to the risk of cross contamination. There are many indirect tests of varying sensitivity and convenience, including DNA fluorochrome staining, DNA probes, PCR, ELISA, autoradiography, immunofluorescence and specific biochemical assays (Reviewed in Lincoln and Gabridge, 1998; Drexler and Uphoff, 2002). Many of these methods are also commercially available for in-house use. In general, indirect tests are not as sensitive and usually require higher levels of contamination (i.e. greater than 104 CFU/mL) for detection (Lincoln and Gabridge, 1998). In recent years, there has been significant development and refinement of rapid microbial methods (including Nucleic Acid Testing -based assays) for the detection of mycoplasma which may provide potential alternatives to traditional methods for some test articles. Overall, indirect tests offer two advantages over direct culture methods: first, they can detect so-called "non-cultivable" mycoplasma species or strains; second, the turn-around time for the assay is considerably faster with results available within one to five days. Figure 7b - DNA fluorochrome staining of Vero cells infected with M. hyorhinis x600. 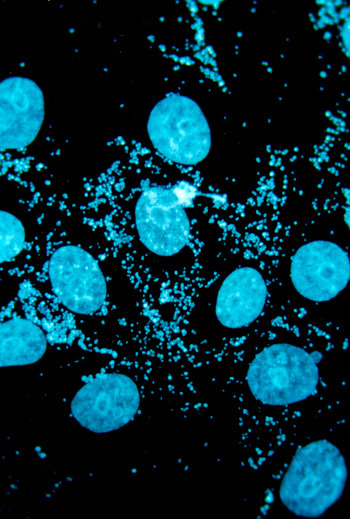 The microphotograph demonstrates the cytadsorption and fluorescence of the eukaryotic nuclei and the extranuclear prokaryotic DNA. Two of the indirect detection methods that are amongst the most common include the DNA fluorochrome staining assay (DNAF) and Nucleic Acid Testing (NAT)-based assays. The DNAF was first described in 1977 by T.R. Chen (Chen, 1977). This familiar technique has the added feature of not only detecting mycoplasma but also other prokaryotic contaminants. By using a stain that fluoresces when it binds to DNA, it is able to stain all microorganisms that contain DNA (Figure 7b). The DNA stains are mutagenic, therefore appropriate precautions must be taken while handling these agents. Interpretation of the extranuclear fluorescence staining pattern can be problematic and requires expertise and experience. For instance, there is considerable variability in the degree of cytadsorption between mycoplasma species. M. hyorhinis is strongly cytadsorbing while the cytadsorbtion and fluorescence from M. orale is weaker. Also, background fluorescent staining of cellular debris or extraneous material with hybridoma cell lines can obscure visualization of mycoplasma, if present. This fairly simple method provides a reliable, fast and relatively inexpensive means for diagnosing mycoplasma infection within a variety of cell cultures. When the procedure is combined with an indicator cell culture the detection efficiency is 98 to 99% in concordance with direct culture (Del Guidice and Hopps 1977; Armstrong, Mariano et al. 2009). This method can be introduced as an in-house assay for mycoplasma screening provided that trained personnel and proper equipment including fluorescent microscope with exciter and barrier filters are available. 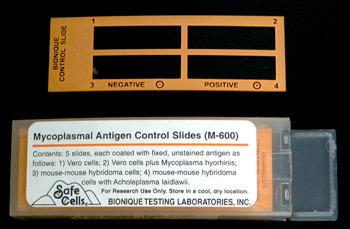 Positive and negative control slides prepared in house or purchased need to be processed alongside each sample batch to ensure the quality of reagents and staining technique (Figure 7c; M-600 Mycoplasma Control Slides). For more information about detailed protocols based on the DNA (Hoechst) staining procedure used at Bionique® Testing Laboratories, view the Safe Cells® articles. Figure 7c - The use of control slides in side-by-side comparison with your own slides will ensure quality of reagents and staining technique. In addition, quality control slides will aid in distinguishing between mycoplasma free and contaminated cell cultures.and application of molecular tools (Drexler and Uphoff, 2002). The emergence of these methods, primarily PCR, potentially expands the options for quality control testing for cell lines and some cell-based therapeutics. These methods are more sensitive than DNA fluorochrome staining and other indirect methods. And in some instances, they offer comparable detection efficiency with relation to culture methods. However, since they are unable to distinguish between DNA from viable or nonviable organisms, they can generate false positive results. Another limitation with these techniques is sample volume, often < 1mL. Mycoplasmas are not evenly dispersed within a sample but instead follow a Poisson distribution. Therefore, false negatives with these assays could occur in low titer contamination events. Misleading results can also be caused by PCR amplicon contamination of the reaction. Contamination generally arises from two sources: environmental and carryover of amplicons from earlier PCR runs. Consequently, it is essential that laboratories using PCR address the issue of containment within the facility layout, workflow process and development of stringent techniques (Mifflin, 2007). In terms of the regulatory perspective of these alternatives methods, the European Pharmacopoeia (Ph. Eur.) and Japanese Pharmacopoeia (JP) have both provided written guidance with respect to validation procedures for NAT methods. The FDA has not published validation guidelines to date. However, the FDA has a draft guidance specific to the production of viral vaccines available, "Characterization and Qualification of Cell Substrates and Other Biological Starting Materials Used in the Production of Viral Vaccines for the Prevention and Treatment of Infectious Diseases" (2006), which cites that PCR-based assays may be used for the detection of mycoplasma provided that comparability with the compendial method (direct culture method and indicator cell culture procedure) is demonstrated in validation studies. Meanwhile, the Parenteral Drug Association (PDA) Mycoplasma Task Force recently organized a subcommittee devoted to evaluating alternative methods for mycoplasma testing. The aim of the global committee is to develop a technical report for publication addressing the validation and potential applications of these methods within the biopharmaceutical industry. Often times, the best approach is to combine direct culture with a reliable indirect method (Table 7a). The U.S. FDA Points to Consider (1993) document has been widely considered as the principal representative of classical mycoplasma testing in the United States. The procedural approach in the PTC, prescribes the combined use of the direct culture method with the indicator cell culture procedure (DNA fluorochrome assay). In addition, international guidelines provided in the Ph. Eur. and JP requires the same approach albeit with minor methodological variation. If the direct culture method is not an option, then a NAT-based assay may be used as an alternative provided that suitable validation studies have been conducted. Mycoplasma screening of cell lines may be accomplished by a DNA fluorochrome staining assay with or without an indicator cell line. As previously discussed in this section, the selection of a suitable mycoplasma testing approach is dependent upon the test article's individual characteristics, importance and applications. Finally, it is critical to ensure that the testing method you select complies with the appropriate regulatory requirements. It is also important to ensure proper sampling and handling of the test article, prior to submission for mycoplasma testing, to achieve the highest level of assay sensitivity. Cell lines should be cryopreservative free and cultivated in antibiotic-free media for at least three subpassages before testing. In addition, in order to meet the specifications of the US FDA PTC guidance, product harvest concentrate should be submitted prior to purification, filtration, clarification or inactivation, when possible. Cell cultures should be harvested for sampling when they have reached near confluence. Resuspension of adherent cell lines should occur by scraping only. The use of trypsin, or other enzymatic agents for dissociation, may reduce the titer of mycoplasma by disrupting the integrity of their lipid membrane (Lincoln and Gabridge, 1998). Finally, it is critical that sample volume size correlate appropriately with the selected transport vessel capacity. Overfilling of a centrifuge tube or flask will compromise the integrity of the sample by contact of the sample with the threads of the neck and cap. If the sample is being sent under ambient conditions, there must be sufficient room available in the flask to prevent leakage and allow for expansion. For frozen shipment, there must be dry ice remaining upon receipt at the testing facility. Test all of your actively growing cell lines at regular intervals to eliminate these cultures as potential sources of contamination. Only cell banks tested for mycoplasma should be introduced into your laboratory or manufacturing facility. Those cell lines which are not certified to be mycoplasma-free must be quarantined until they are tested and proven to be negative. Test continuously maintained cell cultures at defined intervals (most experts recommend monthly to quarterly depending on individual risk assessment). If possible, replace continuously grown cultures with cultures from a mycoplasma tested and validated working stock. Then maintain these cultures on a short term basis (two to three months) before discarding them and replacing with fresh cells from the same certified working stock. This key strategy not only reduces the amount of testing required but, more importantly, it also reduces the problem of culture evolution. The extended passage of cell lines can result in change or even loss of important cellular characteristics. Visit Creating a Certified Working Cell Bank for Important Cell Lines for a simple approach for establishing a working stock for your research program. Make sure all new additions to your cell repository are thoroughly tested at the time of cryopreservation. The routine practice of confirmatory testing prior to cell banking will provide assurance of reliable cell substrate for future use. Begin testing those cultures in your cell repository that were not tested at the time of storage. Quarantine any thawed cultures that have not been previously certified as mycoplasma free until they have been determined to be negative. Purchase raw materials, such as sera and animal or plant derived additives, from reputable vendors which can confirm that each lot is mycoplasma free. Thereby, you mitigate these products as a point of entry of mycoplasma within your cell culture systems. Bionique® Testing Laboratories is a cGMP compliant facility which offers a wide range of mycoplasma testing services for cell cultures, biopharmaceuticals and media/sera products. We recommend that you contact our Technical Service Team for a consultation to discuss your individual mycoplasma testing and regulatory needs. Please click here to view a current listing of mycoplasma products and services. Please call or contact us online to reach our technical experts at Bionique® Testing Laboratories if you have any questions on this material or require additional information.